Some gladiator helms were made to defend against very specific weapons or types of opponents. Others, like this Iron Gladiator Arena Helmet, were made to be protective while featuring a design that is both dramatic and intimidating to look at. This impressive helmet features a rounded crown typical of Roman design, but instead of a ridge or a crest, this helmet features several small studs across its surface. The front of the helmet lacks a ridge, instead featuring an impressively large point that projects out. Even the face of the helm is something to see, featuring protectors that cover the nose and cheeks, while leaving the eyes and mouth open. The overall look of the helmet is to disguise the wearers features somewhat, transforming their appearance into something else, while leaving their eyes, ears, and mouth unobstructed. This impressive helmet is made from quality iron and features a polished finish that will certainly catch the crowds eye. 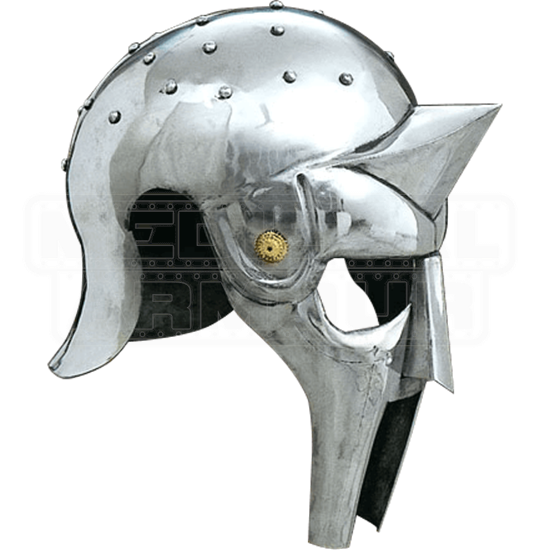 Don this Iron Gladiator Arena Helmet whenever you really want to intimidate your opponent with your appearance and your prowess, or put it on display in your collection at home so that visitors and guests can enjoy its appearance alongside you.